What was it like to play with Sammy Sosa or Barry Bonds when they were kids? Backyard Baseball 2005 features some of the greatest pros, as children, playing along with a sandlot lineup of boys and girls called the 30 Backyard Kids. Along with Sosa and Bonds you can take the playground field with Randy Johnson, Mike Piazza, Shawn Green, Ichiro Suzuki, Pedro Martinez, Alex Rodriguez, Derek Jeter and more. Play in 3 modes: single game, season play and batting practice. See if you can make a tremendous jump into a floating hot-air balloon for massive points -- just one of the crazy stunts waiting for you in MX Unleashed! If you like mud, dirt, high speeds and serious attitude all on two wheels, MX Unleashed is for you! Features an extensive career mode through the Supercross and Outdoor National series with over 100 true-to-life riders. Take your skills into the vast Freeworld mode where you can ride treacherous terrain to your heart's content. 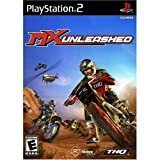 Realistic physics engine, incredible sound, 40 insane tracks to race and intense multiplayer put MX Unleashed over the top! Think you know what it takes to be a winning football coach? Here's your chance to find out! Pick players from the Backyard Kids and 10 kid-versions of real NFL players, Terrell Davis, Steve McNair, Jevon Kearse, Rich Gannon, Ricky Williams, Junior Seau, Donovan McNabb, Drew Bledsoe, Cade McNown and Brett Favre. Direct all the action, set the positions and call the plays. Earn offensive and defensive power-ups, play head-to-head--it's easy to learn and fun to play. It's the chance of a lifetime to play with the pros right in your own backyard. You paid your dues in Tony Hawk Underground. Now it's time to prove yourself in Tony Hawk Underground 2. You've been chosen by Tony Hawk to take on Bam Margera as your teams go on a World Destruction Tour. It's time to go globetrotting on an insane road trip. THUG 2 grinds in with a hilarious story mode, an unprecedented level of customization, and more moves that the Skate Gods could think of. Grab your board, an arsenal of spray paint...jump into the tour van and wreak havoc across the globe. Updated rosters, enhanced play modes, beefed-up character animation and great pro commentary give this game the edge on the ice. Pay no attention to the cheers roaring from the adjacent green. Block that pushed approach shot from your thoughts. Focus on the moment: 12 feet of green, downhill, breaking left--$250,000 rides on a single stroke of the mouse. PGA Championship Golf 2000 gives you all the tools you need to go low, while ensuring that skill and creativity are the primary factors in a well-played round.